In the quiet town of Saanich (located in the British Columbia province of Canada), two University of Victoria students were drunkenly wandering home at around 3:00 AM. Their journey was interrupted, however, when the pair noticed a garage door that was open to one of the residences along the street. Inside was something that apparently no drunk Canadian is able to resist: Zellers BBQ Potato Chips. Despite the item's incredibly low cost ($1.00 per bag), the Zellers stores that carry these deliciously crispy treats will be closing soon. This apparently makes a couple bags of the stuff the culinary equivalent of crack cocaine; the two women brazenly entered the garage, took two bags, and began eating them as they made their getaway. 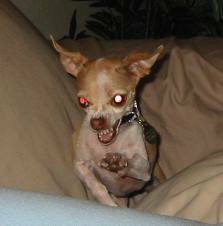 Fortunately for the victimized homeowner (who is choosing to remain anonymous), she was well protected by a vicious chihuahua, who began bravely growling to alert her to the perpetrators' intrusion. "I shall tremble and yap incessantly until they are compelled to go into another room!" The homeowner called the police, who quickly and aggressively swung into action. Officers from three separate units (including a canine unit) swarmed into the neighborhood, quickly apprehending the chip bandits. They also quickly recovered the evidence, despite the duo's ingenious plan to stash the bags in some nearby bushes. Because a crime of this magnitude absolutely requires a press conference, Sgt. Dean Jantzen took to the podium to ease any fears that may have still existed about potential chip thefts. Embedded below is a video of the brave officer attempting impress upon everyone that "these are very specific...and hard to obtain...barbecue chips." He's able to keep a straight face right up until the point where he refers to the burglars as "first time chip offenders." The Canadian local news was also there to cover the story with American-style, hard hitting journalism...which means the shameless use of props and a pointless interview with a random person on the street (including a Q&A about her favorite type of chip). The two suspects are currently facing charges of breaking and entering. Because Canadians are the most polite people on earth, their identities have not been released. 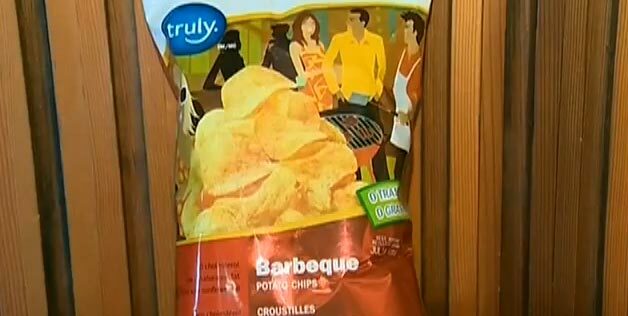 I'm Canadian and know how good those chips are but leave it to CTV to make a big deal about it. they never pay much attention to stories of worth.